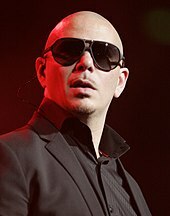 American rapper Pitbull (pictured in 2012), had the first number-one song in the chart. Mexico Airplay is a record chart published weekly by Billboard magazine for singles receiving airplay in Mexico. According to Billboard's electronic database, the first chart was published on October 1, 2011 with "Give Me Everything" by Cuban-American rapper Pitbull featuring Ne-Yo, Afrojack and Nayer, at number-one. The track also peaked at the top of the American Billboard Hot 100. The same year, American performers Maroon 5 featuring Christina Aguilera also peaked at number-one in Mexico and in the United States with "Moves like Jagger". In 2012, Mexican band Jesse & Joy peaked at number one on this chart and the Mexican Espanol Airplay with the song "¡Corre!" that also won the Latin Grammy Awards for Record of the Year and Song of the Year in 2012. Two songs performed by Barbadian singer Rihanna reached number-one, "We Found Love" and "Where Have You Been", the former also was a number-one song in the Billboard Hot 100 and its music video won the MTV Video Music Award for Video of the Year, while the latter was nominated for a Grammy Award for Best Pop Solo Performance. "Bailando" by Spanish singer-songwriter Enrique Iglesias reached number-one on the Mexico Airplay, Mexican Espanol Airplay, and the Billboard Latin Songs chart in the United States, where it spent 41 consecutive weeks at the top and won the Latin Grammy Award for Song of the Year. In 2015, "Lean On" by American electronic duo Major Lazer and DJ Snake featuring MØ peaked at number-one on the chart and was named by Spotify as the most streamed song of all time, with 526 million streams globally. By 2018, Scottish DJ Calvin Harris is the performer with the most number-one singles on the Mexico Airplay chart, with eight chart toppers. Barbadian singer Rihanna (pictured in 2014), has reached number-one twice. Mexican duo Jesse & Joy (pictured in 2012), has reached number-one four times. Spanish singer-songwriter Enrique Iglesias (pictured in 2011), peaked at number-one five times. ^ Starting from the Week of May 28, 2016, the version included in the chart is the one featuring Akon & Mohombi. ^ Starting from the Week of October 14, 2017 (the 8th week at number-one), the version included in the chart is the one featuring Beyoncé. ^ "The Hot 100 – Week of July 9, 2011". Billboard. Prometheus Global Media. July 9, 2011. Retrieved April 13, 2016. ^ "The Hot 100 – Week of September 10, 2011". Billboard. Prometheus Global Media. September 10, 2011. Retrieved April 13, 2016. ^ Johnson, Reed (November 15, 2012). "Latin Grammy Awards 2012: Juanes, Jesse y Joy win big". Los Angeles Times. Tribune Company. Retrieved December 28, 2015. ^ "MTV Video Music Awards 2012". MTV. Retrieved August 7, 2014. ^ "Frank Ocean, fun. Lead 2013 Grammy Award Nominations". MTV. December 6, 2012. Retrieved April 13, 2016. ^ "Romeo Santos, Enrique Iglesias win big at 2015 Billboard Latin Music Awards". CNN. Turner Broadcasting System. May 10, 2015. Retrieved December 28, 2015. ^ "Leaning power: Spotify names its most streamed track of all time". The Guardian. Guardian Media Group. November 12, 2015. Retrieved April 13, 2016.